Only use fuses that have been approved for Mercedes-Benz vehicles and which have the correct fuse rating for the system concerned. 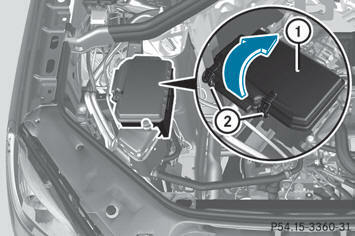 For the fuse boxes in the engine compartment and under the rear bench seat, only use fuses with the suffix "S". Otherwise, components or systems could be damaged. – Park the vehicle and apply the electric parking brake. – Switch off all electrical consumers. – Remove the SmartKey from the ignition lock. The fuse allocation chart is located in the fuse box under the rear bench seat. Do not use a pointed object such as a screwdriver to open the cover in the dashboard. You could damage the dashboard or the cover. 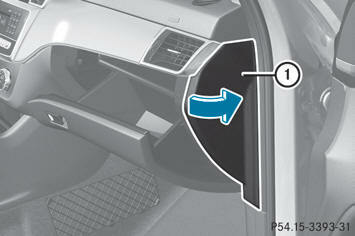 – To open: pull cover 1 outwards in the direction of the arrow and remove it. – To close: clip in cover 1 at the front of the dashboard. – Fold cover 1 inwards until it engages. – Remove any existing moisture from the fuse box using a dry cloth. – To open: open clamps 2. 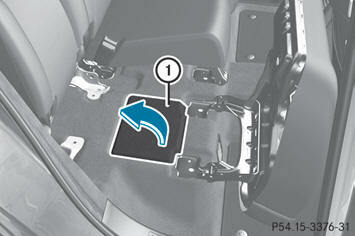 – Fold cover 1 upwards in the direction of the arrow and remove it. – To close: check whether the seal is lying correctly in cover 1. – Insert cover 1 into the retainers at the side of the fuse box. – Fold down cover 1 and close clamps 2. The cover must be positioned properly. Moisture or dirt could otherwise impair the operation of the fuses. 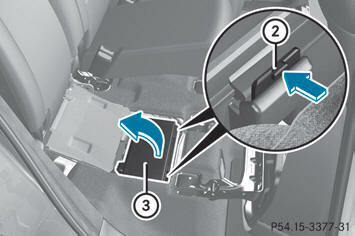 – Fold the right-hand rear bench seat forward. – To open: lift and fold back carpet 1 in the direction of the arrow. – Release clamps 2 by pressing them in the direction of the arrow. – Fold cover 3 up in the direction of the arrow and remove it. The fuse allocation chart is located under cover 3. – To close: insert cover 3 at the side of the fuse box into the retainers. – Fold down cover 3 until clamps 2 engage audibly. – Fold the right-hand rear bench seat back.